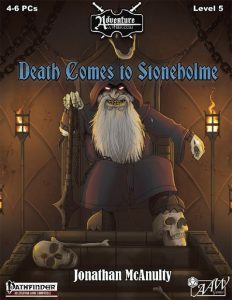 The third of the underworld-adventures set in the dwarven city of Stoneholme clocks in at 52 pages, 1 page front cover, 1 page SRD, 1 page advertisement, 1 page back cover, leaving us with 48 pages of content, so let’s take a look! While it is not required to have played “Dark Days in Stoneholme” and “Murder in Stoneholme” to enjoy this module, I strongly suggest doing so, for this adds a) more player-investment and b) more gravitas to the module’s plot. Since I played the module as Part III of this series of adventures, the following review will contain minor SPOILERS for the previous modules as well as, obviously, SPOILERS for this one. Potential players should jump to the conclusion. The worship of the archdevil Dispater has been prohibited in Stoneholme since its inception, but like the proverbial worm in the apple, it had a way of coming back. After the alliance with a house of devil-worshipping dwarves allied with a tribe of goblins has been squashed by the PCs, ending their quasi-terrorist attacks, the PC’s patron, Lord Deppenkht, has risen in prominence. A general, schematic map of the city is provided alongside some rumors. A friend of said patron, Lord Aldarn Starkherk, reports receiving death threats and since the PCs have a reputation of being capable in dealing with such issues, it is they who’ll get the job of securing the good lord – probably after saving him from some nasty dark creeper assassins in the streets. Deppenkhut, after providing a sumptuous feast for the PCs, thus beseeches the PCs of fulfilling their bodyguard duties for the lord. Thus, the PCs are invited into the house of the good lord, which is btw. fully mapped and comes with a player-friendly iteration – kudos! Speaking of the disease, analyzing it may point out that it is an infernal, nastier variant of ghoul fever…which points towards the massive cave adjacent to Stoneholme, the city tombs, a massive necropolis found in two caverns on top of one another – with a nice sideways full-color map depicting this gigantic area as well. In case your PCs are suspecting Deppenkhut themselves (or are stuck), there is a chance of him actually being seen near the metropolis, the options of the PCs witnessing an infernal ghoul transformation…it’s impossible to get stuck in this investigation, which is very much a good thing. You see Deppenkhut is pretty much the Dispater-kingpin in the city…and Starkherk, being just as devious, has actually known all along and makes this his bid of power. Deppenkhut, in the meanwhile, can use his cleverly concealed magic power and items to actually react dynamically to the investigation’s process with the perfect alibi, namely being in prison. Obviously, he can thus, mastermind style, easily vanish to plague the PCs another day…and frankly, he kinda deserves the chance. Within the necropolis, capable trackers may follow the trails found there to either a tomb adjacent to Starkherk’s sealed tomb or to the hidden lair of the dark folk that had been assailing the PCs and their allies. The dark folk lair not only contains a couple of powerful adversaries (with class levels and an imho underpriced magical club), but also moldants, poisonous, fungoid watchdogs that erupt in spores, potentially infesting whole areas. Area number 2 would pertain the aforementioned tomb complex and has a distinctly infernal theme, with aforementioned infernal ghouls, a devil, a ghoul wizard and the now-undead Aldarn awaiting as the BBEG in a challenging, nice dungeon. Beyond the already-mentioned moldants, the infernal ghouls used in the adventure also get their stats – not, they are not simply ghouls with the template of the same name added! As before, the complexes in the Necropolis feature player-friendly versions – sans secret door and trap markers and, better yet, even sans headers. You definitely won’t have to cut anything out when using the module. Editing and formatting are very good; while I noticed a couple of minor formatting hiccups, they did not impede in any way, shape or form my ability to run this module. Layout adheres to a nice, two-column full-color standard. The pdf’s art employs a combination of previously used and new full-color artwork – nothing to complain about here. The cartography by Tommi Salama and Jonathan G. Nelson is of the usual high quality for AAW Games -and deserves special praise for the neat player-friendly versions and the overview maps that present the side-view of the city tombs – it’s little touches like this that separate “good” from “very good.” The pdf comes fully bookmarked for your convenience. Jonathan McAnulty’s 3rd trip to Stoneholme is the best so far; in particularly the middle section, the book features a level of detail and consideration for the GM I rarely see in such a set-up. The adversaries the PCs will have to face are pretty powerful and well-crafted and the respective environments are thematically concise. The best thing about this module, though, is honestly that it manages to depict a smart villain who continues to act smart throughout the module; and said villain isn’t even the BBEG and may be used by the enterprising GM as a kind of Moriarty-like foil; if your players and PCs are in any way like, mine, this guy may act as a perfect way to lure them anywhere…for after playing Part I – III, they will hate him and be out for blood…or, well, still believe him. This makes the module so fun, at least to me – it is actually a module that dares to play its foes smart and in a way that is both logical and concise. There are modules out there with more far-out concepts, sure; but if you’re looking for a module that makes “realistic” sense or a nice investigation, then this most certainly is for you, particularly if your players already enjoyed the first 2 modules in the series. My final verdict for this nice module will clock in at 4.5 stars, rounded up to 5 for the purpose of this platform; however, if you’re planning to use this as a stand-alone, it’ll lose some of its flair. As a standalone, I’d round down instead. You can get this neat adventure here on OBS!